Simple Poached Salmon - GetCooking! Martha Stewart – Simple Poached Salmon recipe. Just Press Play to Get Cooking! We’ve taken all of the hard work out of finding the right recipe for you to cook. Our ad-free recipe videos combine directions, ingredients and even information about cookware and matching wines – all in the one, intuitive interface. We’d love to hear your feedback on this video recipe format in the comments section below! 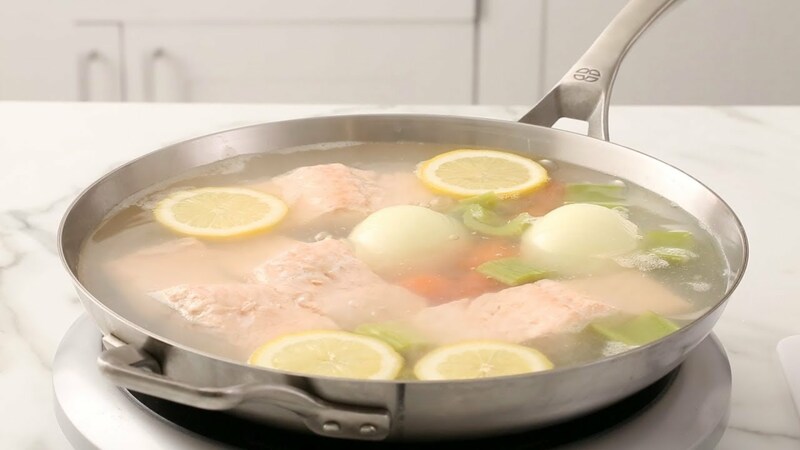 If you used this video to make Simple Poached Salmon, please tell us how it went! Is there a recipe video you’d like to see in this format? Leave a comment for us below and we’ll make it for you! Browse all of our recipes, from quick and easy weeknight dinners to holiday favorites. Whether you’re in the mood for chicken, one-pot pasta, or a chocolate dessert, we’ve got you covered at marthastewart.com. View the original recipe notes here: Martha Stewart – Simple Poached Salmon. This post may contain links to Amazon or other affiliate partners; your purchases via these links can benefit Get Cooking and help us avoid excessive and obtrusive advertising. Don't be shy, stay in touch! Thanks for getting all the way to the footer. Seeing as you're here, you may as well investigate our social channels! Or feel free to contact us. Created by Us. Powered by You.